It works and does it very well. I like the dashboard and the way it operates. Customer Support is also top notch. They constantly go an extra mile by giving hints and tips on how to use the tool better. They even sometimes help configure specific settings. It is not perfect. As all monitoring tools, this one too doesn't see everything and doesn't reach everywhere. Lately, it is more difficult to get results from Facebook. Facebook groups are a big thing now and no tool seems to offer insight into that. If you can afford it, it is good idea to have more than one tool like this. You will have a wider array of results to work with. This tool can be used in more ways than most people imagine. Obviously, you can monitor your brand. But you also can look for people that have a certain problem, or search for a piece of certain advice. You can also monitor the competition, which gives you countless amount of opportunities and knowledge about the industry. Jakub, big thank you for your review, we really appreciate it! We have just updated our feature - pdf reports. Here you can find all of information about the update - https://brand24.com/blog/feature-update-pdf-reports/. "USING BRAND24 FOR 2 MONTHS (MY EXPERIENCE)"
Simply put, the Dashboard is good. It's ability to quickly provide a once-over look that provides a quick snapshot of everything that's going with the social media profiles I and my team are managing. Also, importantly is the competition tracking on social it also allows. This is very good! There are a few things that can be made better. Insight generation and sentiment analysis can be much better. It would also be good for the team to consider providing support with developing negative incidence sentiment audit & analysis reports as well as social media strategic measurement & reporting framework for same client. I have used Brand24 as a social listening tool on and off for about a year now, and recently set up a subscription for one of my clients. We're also using it for cold calls and prospecting clients who have had negative experiences with competitor clients. It's also the basis for our Digital Analytics programme to help clients with decision making, audience analysis, as well as testing new Brand Advertising materials before launch. "Brand24 is the 1st Email I Look at daily! Here's Why:"
My favorite feature of brand 24 is the daily email I get each morning sharing mentions by top influencers on Social Media and new mentions in online posts with links to our companies website. This is a great way to spark engagement by reaching out to start a discussion or to simply thank. Honestly there are no features that I dislike, based on the current way I use Brand24. Outside of the tool being easy to use, their support is phenomenal. Many times I'm notified of a new link to our website before the writer who may have done a guest post on someone else's website. When I reach out to thank them, this not only starts a great conversation, but they're happy we notified them and they're more likely to mention Social Quant again in a future blog post. "Brand24 helps me on daily basis monitoring social media." I like form in which Brand24 shows the results - I like charts and the fact I can prepare infographic for my reports. I like Brand24 listen to suggestions - I had an issue with influencer score which for me was crucial - and they fix it. Now works much better. I think I don't have the functionality which I don't like at the moment. Of course, it would be awesome if Brand24 had results faster and more specific sentiment filter. But I get it - Polish as a language is not so easy to be taught to algorithms. At the moment the primary functionality is finding not satisfied users. Thanks to Brand24 we can react and ask questions. Very often because of those conversations we get very meaningful insights about our product. "Lower Price for The Same Features"
The layout of the Projects menu is easy to navigate, edit and sort through different social channels. I only use the Personal Plus subscription, so I know projects are limited but it would be nice to be able to track a few more keywords/brand mentions/hashtags for projects. Trying to locate all mentions of our brand, SelectBlinds, we've found more hits for our brand mention than the previous platform that we used and they're easier to access and catalog. Thank you very much for your reveiew! Much appreciated! "One of the Best Social Listening Tools"
I love all of the dashboards that you can create as well as the infographic PDFs that it makes for you. This gives clients a super quick snapshot that we can send over when things get busy. I also love that it can estimate total reach around topics and break out which of those are positive and negative. I'd love it if they could pull in Pinterest metrics. I know not many tools can do this, but Brand24 would absolutely become our go-to if they could offer all platforms. Social listening and identifying key influencers have been the biggest problems that Brand24 has helped us solve. Compared to some other tools we have tried, we really like the added benefit of each mention receiving a rating of how influential the person is leaving the comment. This helps keep things in perspective and know when it is especially important to act. Brand24 is one of the most robust social tracking tools we have ever used. The ability to track nearly keyword or hashtag across multiple platforms is amazing. The filtering tools are top notch and the ability to generate reports with 1 click to share with teams is killer. Limiting the number of trackers is frustrating. Would like to see it at 20-25 instead of 10 on the regular plan. We needed to track certain keywords and hashtags across multiple social platforms and Brand24 has been the perfect solution. "More prospecting possibilites and more security"
The best of Brand24 is the quick info you get when your brand or name is mentioned in the internet, so you can react at the right time. I also like the division on different channels in the admin panel and possibilities to mark the sentiment of mentions. And all the reports, and the way it shows your reach in social media, and the infographics it generates on you data. The admin panel could have a better modern look. It also needs some correction of UX, especially when you try to set up new projects - you can get confused when adding new key phrases. You can easily use this tool to get to new prospects in a way, they would not expect, but can really appreciate. All you have to do is to monitor some key phrases referring to the problem your product or services resolve. "Brand24 - great tool for internet monitoring"
I've been using Brand24 for a few months now. Brand24 gives me the list of the mentions from all social media which i need. I can create raports that are simple to read. There is nothing like that. Because there is a chat with quick support from Brand24 customer care. Whenever i have problems with something, i just chat with support. Good way is also to mention Brand24 on social media and they respond very fast! Try Brand24 if you want know what people talking about you, or your brand in the internet. Feel free to contact with Brand24 supports, they will help you. I can measure how many Poles and foreigners speak about my brand or Poland. I can measure volume of mentions, sentiments. It gives me ability to respond when for example foreigners write something about my brand or Poland. "Brand24 for In-House Influencer Marketing"
I'm able to compile a quick and concise report for my company that outlines our social media data for the month, and also easily compare data to previous months to build a steady baseline and projections for growth month to month, year to year. I'm currently on the Professional Premium plan. Considering the tools that are available to me in this package, it seems bizarre that the number of interactions are not included. I also find that certain features are not as intuitive to find e.g. when I was trying to add a new user I had trouble locating where my email notification settings were saved and how to add her to receive the same. I also know from my demo session with Emily that I can filter results to exclude our own oVertone accounts or our founders accounts (for example), but I have yet to go back and figure out how to set that up myself. I also wish the numbers were more accurate for Pinterest and other sites outside of IG, FB and TW. We know Pinterest is really important to our audience and where they're sharing a lot about us, but Brand24's links don't make it easy to identify who is actually posting and repinning about us, and what their reach is. We are able to easily track large amounts of data to secure total figures surrounding the amount of posts and reach generated as a result of our social media / influencer marketing outreach efforts. It saves a lot of time vs. doing this manually and the email notifications assure me that Brand24 is capturing all the right posts in its data. "Great tool for social media analytics"
We do not have the top plan for this software, but we're still able to gather all of the social media analytics data we need to get a good idea of the conversations customers are having about our industry. The trend line that maps out mentions over time has been especially helpful, as it allows us to identify peaks in conversation and then dive deeper into why those peaks occurred. I would appreciate an easier format with which to export results. I often want to use graphics that are generated in reports in presentations to superiors, but the graphics are small and hard to read. I recommend that they attend the training sessions offered by Brand 24 to get a full idea of the how to use the software. We are using Brand 24 to identify ways that the food industry can better communicate with consumers. We know that social media is the tool that many people turn to educate consumers, so we are following this lead and using analytics to find out what kind of conversations are happening and what consumers want to know from the industry. "Keeping up with sources, keywords and companies"
We rely on Brand24 to provide simple evaluations of a companies mentions across social and the web to determine the quality of the sources they are publishing to and/or the sources that are sharing information about a company. We wish that the web service or API was more robust. We also would like the rankings for quality to be upgraded. It's good but there is always room to do more in this area. Brand24 helps us see the big picture of sites, social and other sources for specific use cases. For us, that often involves weeding out sources based on quality and this service makes that easy. "Just started using Brand24, so far great tool"
This review is not about me, I won't dwell on my webinars. But social response is important, you can find what people think about your content, and where the pain is (to get new topic). I have used Brand24 for some 3-4 weeks, and being not very technical myself found it very easy to handle and very quick to pick up Social Signals. That;s probably what I need. Funny enough, I found several mentions of our Google Q&A I wasn't able to with different software. There were no links there, polite request solved the problem. "Really great social listening tool, could use minor improvements"
I really love how powerful it is. Out of the many social listening tools I've worked with, Brand24 seems to be the best at finding things quickly AND finding things that some other tools miss. I the user interface could be a lot more intuitive and a less complicated. It's a bit overwhelming as there's a lack of hierarchy in the layout--everything kind-of washes together. I would also like to be able to reply/respond to things within the interface, rather than having to open a new tab/login somewhere else to respond. If you're looking for a powerful tool to track your brand mentions, or even competitive keywords, Brand24 works great. There's a slight learning curve with the interface, and it doesn't give you tools to take action on mentions from inside the interface, but not everyone wants/needs that anyways. Keeping track of brand mentions. "Good tool, but needs UX/UI improvement"
Brand24 provides a lot of information and insight into who is talking about your brand. You can create projects based on keywords which allows you to join relevant conversations and stay up to date on target topics. The UI is pretty rough - the site feels crowded and sometimes it's difficult to navigate. It's rather expensive for what's being offered and you don't get to create many projects for the lower price tiers. Choose your keywords wisely because you are only allowed to track a few with most plans. Keeping track of brand sentiment, planning for campaigns and effectively distributing content. "Best socialmedia tool to analyze Your brand"
This team is making very good job! You are all the time on time, now You can know who is talking about You, Your company and brand. Its perfect and i think each company need this. "No way you will find better monitoring tool!" The greatest thing about Brand24 is the support working with the speed of light! Mobile app is still not adjusted to the iPad's screen size. The interface and the speed of collecting data perfectly works for me. I hope Brand24 will improve their mobile app more but the web app is just perfect. If you are looking for the social media monitoring tool, just give it a try. I was skeptical at first but after few weeks, I found a lot of usage I just didn't realised they work for me. Another thing is very clear raporting. Just a few clicks of mouse and I am able to make very transparent raports about project I am working on. Last but not least, I need to praise the legendary support. It takes just a few seconds to get your problems solved. It's like they never sleep. This is the most valuable thing about this company. They are always ready to help with any problems with their tool. What is more, they are really helpful not only with the technical problems but also with some inspirations about how you can use their monitoring in your business to improve it. 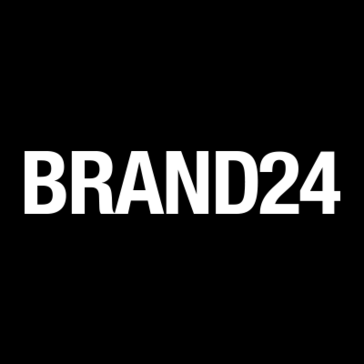 All the tips I got from Brand24 supporrt were really useful! It works just like monitoring should do it. It keeps me informed about mentions and I can work on different projects from the very transparent interface. "Brand24 gives me a great view of the topics that I am interested in, helps developing my blog." Thanks to this tool I don't miss anything about most important topics that I decided to follow. I can monitor the results found in the internet every day! The reports inform each day about new mentions. Thanks to that I can analyze my client's needs and develop my blog. I can also track my competition and see their actions in one report. I can track forums and find new readers/customers by answering their questions! This is very helpful! Also I would like to reccomend the staff, who are more than helpful and ask about support without even my request. That is very kind. Honestly I cannot find disadvantages of using Brand24. The settings are clear and i can always change them f.e. frequency of receiving reports if it's too often. If you want to fully monitor key topics in internet and track your competition this tool is perfect for you! The greatest benefit is that I can track key topics in forums, in google and look into my competition. I have found new possibiliteis to find readers and to meet with new bloggers just by tracking suitable key word. Monitoring and analyzing is way more easier! "Great tool for understanding Social Trends"
I like that Brand24 will send you an email every day with updates on postings related to your keywords. This is very helpful when you are busy and sometimes forget to login. It forces you to look at the data and stay current. I dislike how broad the results are. Maybe I am missing something but I feel that you should have the ability to really narrow down the search if you are targeting a broader keyword set. Give it a shot. I think it can be an asset to any company looking for social sentiment. I am understanding what the landscape looks like as it relates to my business. Since what I do is almost 100% social media driven it is helping me to understand what challenges exit, companies to target, and how big the opportunity is. "Let's be honest. In marketing we need those tools"
1. First - simplicity, brand24 is perfectly designed. Build in professional CRM - it would be great if b24 had that feature. "Always fun to know what they are writing about you"
Exceptional support - the way they treat every customer - even the smallest one. They help you configure brand monitoring in no-time and you're good to go. The way you configure and monitor your brand / person whatever makes it extremly easy to see what's going on. They help all the way to be as successful as possible. Knowing what they write about a brand make a good competitive advantage to your brand. So if you want your brand to stand out you should definetely give it a try. 30 days trial lets you experiment and see everything there is to it. "Made us aware of people talking about our Brand in places that we didn't know about"
Storm alerts! Being able to quickly respond when activity picks up has been key. This does more than Hootsuite or other social media monitoring. Using Brand24 reaches out beyond the obvious places and lets you know about more intimate opportunities to engage customers or potential customers. We're engaging people in more places than before. So many forums beyond just social media that are difficult to monitor without the kind of consolidation that Brand24 provides. "Morning coffee routine ;) "
I've been using Brand24 for a few months now. What I like best is that Brand24 gives me also the list of the mentions from Facebook (from what I know other monitoring tools don't have that option). I would change the design of the product to make it more clear. The name of my company is specific, because it's at the same time the name of the whole category of tools (LiveChat). Because of that I don't look at the graph with the number of the mentions and don't use it for social analytics. However as I wrote in the title checking new mentions in Brand24 and a cup of coffee is my morning routine :) I use it for monitor the Internet and reply as LiveChat if it's necessary. "Brand24 for serves me to develop my parenting blog as a brand"
Brand24 has an easy and self-explaining user interface. Every time I need I can get help (online consultant). I work often over-night so it's a benefit for me. The application helps me with the internet monitoring which I would not be able to do on my own. What I care most is to enlarge number of UU visiting my blog. I put much attention on positioning search. Using Brand24 I check how my keywords are responding to the users needs. "Great app to know what people are saying about your brand!" Brand24 is amazing tool. I use it in many ways, for example to measure buzz success on my video campaigns (mostly on YouTube). But also too see what people are saying about my brand! What it like the most is this simplicity in use (great UI) and power when you see results how it works. I highly recommend to everyone who deal with marketing! Configuration process is little bit challenging. But there's a chat and I got quick support from Brand24 customer care. Hence, whenever you have problems with sth, just chat with support. They're great. Or try to challenge Brand24 by mentioning them on social media. I did and they respond quickly too! I measure how many people and how they speak about my brand. I can measure volume of mensions, sentiment and also see each of the mention. It gives me ability to respond if stakeholder (who wrote sth about the brand) wrote to give feedback or to ask something. "Brand24 - Great SMM Software"
- For any issues, there is really great support service. I don't like only because Brand24 does not provide social media response services. Data downloading should be improved a little bit Also, wish I could post to my own social media accounts from this software.Historical data are unreliable for old data. Maybe it's a little bit expensive too, but it worth to try it. Brand24 is a great choice for growing business, it will increase your brand awareness on the market. It will enable you social listening and it will help you reach for users' insights. This software will also help you to monitoring your competition. Great platform which will help you to gain advantage on the market. Everybody should try it out. Absolutely positive review from me. "No need to look for your client anymore... "
I user Brand24 for 3 private projects and with almost every of my client. It's amazing how close you can get to your client just by opening up your ears. and listening what he has to say when he's on his own backyard (his own social media channel). All you have to do is to figure out how to help him out and how to help your business by doing that. Brand24 lets you see and hear what people are saying about you or about the issue your service is solving. What I dislaike is that companies are not yet ready (structure wise) to work with so much data :) But hey, that's a nice problem to have. Imagine you can see and hear everything your current AND POTENTIAL clients are talking about in public. That's it. That's what it does. It's a powerfull tool that brings you closer to people thouthts. With most of my clients we are working on converting people's voice into value. For instnace one client tracks everyone who says good things about his company and just to say "thank you". By doing that he feels (and it works as the % of coming backs got higher since he started doing that) like he's bonding with his clients. For others we look for people who are talking in general about the topic our company is about. For example I work with a company that looks for poeple seeking specialist in specific field and we suggest them using one of our own with a personalized bonus offer. "The best social listening tool I know"
Brand24 is dead simple to use. Also, it integrates with Slack so I don't even have to log in to my account - I receive notifications on a Slack channel. It makes reacting to mentions of chosen keywords easier and faster. It's not 100% accurate - it won't show some mentions. That said, I haven't found any more accurate tool. Start a trial and see how it works for you. I can react whenever someone mentions a keyword of my choice (e.g. 'feedback widget', 'website feedback' etc.). Joining conversations is a great source of leads. Tip: monitor brand keywords of your competitors to spot angry customers and help them. "Love this tool for listening and prioritizing responses "
I love the sentiment analysis feature that categorizes mentions into three simple categories - positive, negative and neutral. Makes responding to people much easier, considering that I have very limited time during the day to do so. The daily reports are very useful. I would love it if the app had an inbuilt tutorial to help users figure out what to do as soon as they sign up. We've found the app useful in locating important conversations to be a part of. I'm personally using it to target interested, potential clients better, by joining in on the right conversations. "This online monitoring tool will save you a lot of time!" Brand24 is the best tool I've tried for monitoring and analyzing a buzz around any brand across the web and social media. What is amazingly useful it collects information not only from your social media accounts and not only when someone tags you - it actually monitors any mention about your company! I also like to track topics and trends. It helps a lot each time I'm launching a new product or entering new markets. It's a real time-saver! Nothing so far, I'm satisfied with the tool. Try to monitor not only your brand but also competitors and topics/trends. It is a mine of information. Monitoring all social and online media. When you are managing online marketing you have tons of places when you are active or you potential (and current) customers are talking. The quality of the mentions that online monitoring tool provides you is crucial. Brand24 collects mentions in one place, you can filter by source and relevancy. IT save so much time on the marketing daily work. "All In One Solution! " As a PR agency, it's critical to our success to be able to monitor media coverage, social coverage and all things in between. Brand 24 does this for us - in real time! Gosh - not much do we dislike. Wish I could pinpoint one thing, but actually - we're pretty darn happy with Brand24. Social intelligence. Media coverage. Real time data analysis of campaign content, etc. The user interface of the tool is brilliant and really intuitive and being able to compare projects to work out share of voice is extremely useful. The fact that it can also be used as a sentiment tracker and an influencer sourcing tool makes it extremely good value for money. It would be great to filter the mentions by country instead of just by language, but hopefully this is in the pipeline. Proving the impact of campaigns on the social pace is always a tough ask. Being able to see the impact on social mentions and reach day by day in an accessible way allows us to demonstrate the ROI of our activity to both internal and external stakeholders. "Great tool for a corporate Brand Manager"
I love B24 just being there as a daily routine in brand manager's life. Everyday starts with coffee, sales results and B24 report. The key value to us is the REAL social listening. This gives us an instant but also systematic overview of the brand's social presence as well as valuable insights for brand development, including new creative ideas and communication platforms. I love it's real time, not only it gives me a sense of confidence we're controlling any crisis situation that may occur but enables lots of authentic occasions for our brand character to interact with consumers. When you monitor a big global consumer brand like we do, you might want more synthetic reporting providing you with more insightful knowledge clusters rather than information stream. When there's too many discussions going on you might need a full time agency capturing insights for you. Lots have been improved in total reach estimation but they're half way there to be a comparable source to AGB, Nielsen media panel or any other media flowchart. One of the biggest pros for B24 is their customer support. It's not surprising for anyone in the industry having their CEO discussing your problem at the help desk. And even when he's out things are moving fast and forward, just to keep your satisfaction lever way above expectations.